If you are like most migraine sufferers, you’ve tried at least three or four things to help prevent your migraines or reduce your migraine pain. And if you’re like most of those people, nothing has worked. We get it. Migraines are tough to treat. They affect different people in different ways and there are so many triggers. What triggers an attack in one person may not trigger an attack in another. This makes it very difficult to find a treatment that works across the board for all people, all migraines, and all triggers. But that doesn’t mean that scientists aren’t trying. Great strides in migraine relief have been made within the last few years. Drug companies have developed several effective migraine medications and introduced them to the market. However, for a number of migraine sufferers — maybe including you — drugs aren’t the ideal answer. You want something natural, pure, and clean. You want a treatment that focuses on wellness and overall better health, rather than a drug that merely dulls the pain and comes with unwanted or potentially harmful side effects. In short, you want a treatment you can trust and feel good about. You want to know that what you’re putting in your body is safe and natural, and you want to be able to afford it. But it still has to work. That’s a pretty tall order. Fortunately, science continues to develop more safe and natural products that can help you manage your condition. CBD oil has potential as one such treatment that could top your list. Let’s take a minute to get better acquainted with this possible natural migraine remedy, and bust a few cannabis myths in the process. Cannabidiol (CBD) is a naturally-occurring product of the plant species cannabis sativa (hemp). There are several subspecies that fall under this category, each with varying levels of the mind-altering substance cannabis is famous for, THC (tetrahydrocannabinol). Some have a very high concentration of THC, and others have a very low or nonexistent level. Unlike THC, CBD is not psychoactive and may actually inhibit any effect that the THC would have on the nervous system. So when it comes to getting high, CBD oil is pretty far down the list. While many people associate hemp with marijuana, recreational use is just one small aspect of this beneficial plant. In reality, hemp is used in a variety of non-psychedelic ways. For example, hemp seed oil can be found in paints and lacquers. It can be burned for oil lamps, and is also used in cooking. The seeds may be found in feed for caged birds. Several car makers even offer hemp-based upholstery as an option for some models, and hemp clothing has been around for decades. The leaves and flowers of the hemp plant have long been used for ointments, teas, and tinctures, as well as vaporized or smoked for medicinal and spiritual practices. CBD oil has long been used to treat diabetes, depression, arthritis, and multiple sclerosis. More recently, migraine sufferers are of the opinion that it helps to ease migraine pain, and even shorten attacks. However, using this plant to treat headaches is not new. As an ancient natural remedy, cannabis has been used for thousands of years to treat certain types of headaches. Emerging scientific studies might lend support to trying CBD oil as a viable treatment for migraine. These should not be confused with the studies that examine the use of the entire plant, and may include THC. This is not the same as pure CBD oil. While these studies do support cannabis as an effective migraine treatment (when including THC), the absence of THC is what sets pure CBD apart. This makes isolated CBD more desirable for a lot of people. CBD oil is available in many different forms with different concentrations of CBD. It can be taken orally in softgel capsules, under the tongue sprays, and tinctures. Some people vape or inhale it. Another common form is as a salve or cream that is applied to the skin. 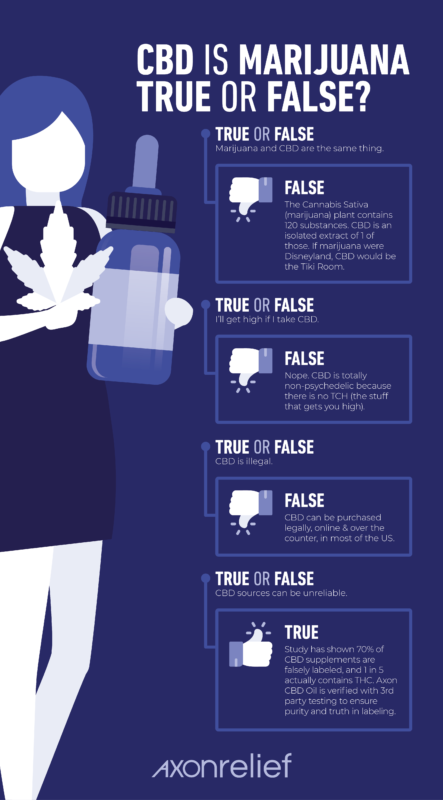 CBD oil is safe for most people, and there is no evidence at this time that it interacts with other medications. However, if you are on any medications you should check with your doctor before you add it to your migraine relief tool kit. At Axon we know that a migraine is more than just a headache – much more. In fact, many of our staff are migraineurs. That is a large part of what drives our passion to find natural, safe, effective relief for migraine pain and fewer migraine days. This is also what drove us to develop our CBD Oil for Migraine. If you suffer from migraines, it could help you get relief. Here are three very good reasons why you should consider it. 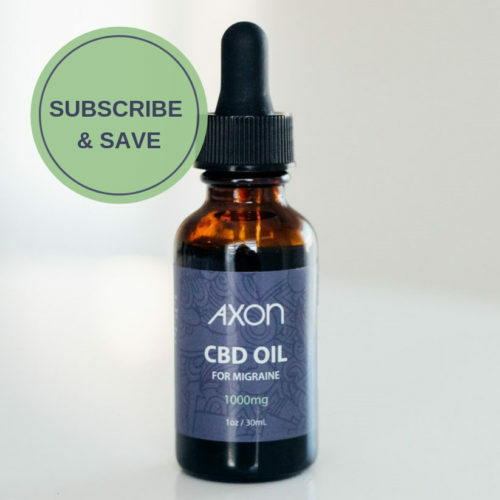 It’s an All-Natural, Drug Free Migraine Treatment – Axon CBD Oil is all natural and drug free. It does not contain any THC or drugs that could cause a “high” or potentially harmful side effects. Clean Means Clean: No Colors, Flavors, or THC – Axon CBD Oil is totally clean. There are no colors, flavors, THC, or other additives. What you see on the label is what you get, so you don’t have to worry about what you are putting into your body. 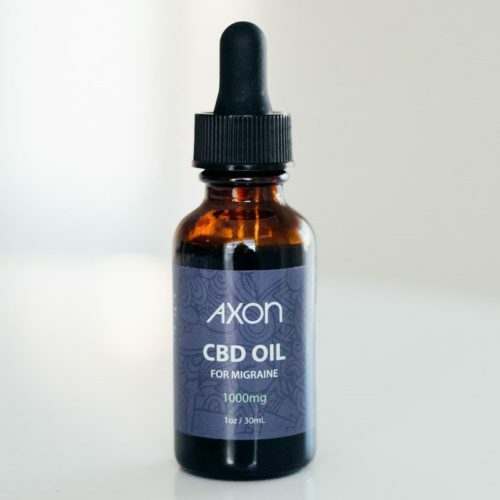 A Process You can Trust – Every bottle of Axon CBD Oil has undergone rigorous third party testing in an FDA-registered facility. So you know you are getting a product you can trust. 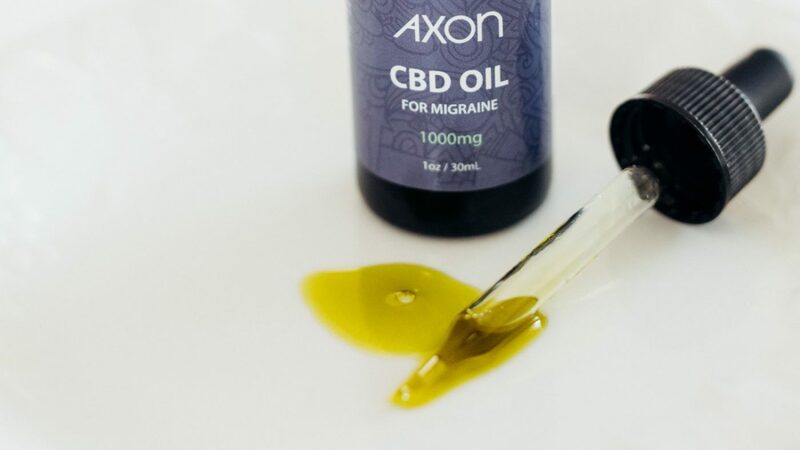 Try Axon CBD Oil for your migraine pain and you could have fewer migraine days. (2011). Taming THC: potential cannabis synergy and phytocannabinoid-terpenoid entourage effects. British journal of pharmacology, 163(7), 1344-64. I purchased the CBD oil, but no instructions come with it. What is the recommended dosage? How much and how often do I take it? How do I use it, topically or orally? This product is intended to be taken orally. There is no magic number or recommended dose for CBD. However, it has been found to be safe even in high dosage, with no major side effects. According to a 2018 study, “adverse events of cannabis medicine pertain primarily to THC, whose total daily dose-equivalent should generally be limited to 30mg/day or less.” By contrast, CBD was found by the same study to be far less potent, which means it “may require much higher doses for its adjunctive benefits on pain.” As with most supplements, it is wise to start out with smaller doses to see where relief begins and how your body reacts. You may increase your dosage over time to find the right level for you. 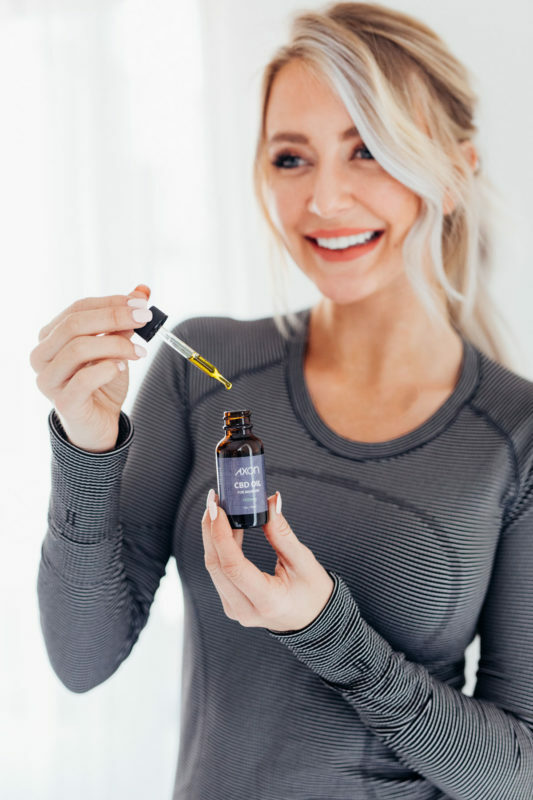 As with any supplement, we recommend following the label instructions for Axon CBD Oil and taking note of how you feel before making any personal adjustments.